Against this somber backdrop, today’s Cambodian physicians attempt to help fellow citizens suffering with rheumatology problems, with some help from the outside world. Victoria Seligman, MD, MPH, a rheumatologist and internal medicine physician at the Denver Veterans Administration and the University of Colorado, has volunteered in Cambodia for 14 years. “When the Khmer Rouge were done with Cambodia, by most accounts there were fewer than 20 doctors still alive in the country,” says Dr. Seligman. “The new government sent their best and brightest abroad to study medicine, so there is now a growing number of physicians in the country. There are still no fellowship-trained, government-licensed rheumatologists, however. The Tuol Sleng Genocide Museum is a museum in Phnom Penh, chronicling the Cambodian genocide. In the West, rheumatologic conditions typically don’t prove fatal, but they can be in a country where the minimum wage is $153 (U.S.) a month.2 “Cambodia has the most severe lupus I have ever seen,” says Dr. Seligman, who has worked in several developing nations, as well as with underserved U.S. populations. “There are layers of complexity involved, in part because of poverty, and in part because doctors don’t know if patients will/can comply with instructions. Because of the expense, people will take half of a half of a pill. And each dialysis session [costs] $180, so patients try to spread them out—if they can even go at all. Dr. Seligman (far left) at a Cambodian hospital with other doctors and students. Asked about RA, Dr. Seligman says, “Even though ours is not a pediatric hospital, we have occasionally had children wheeled in who have clearly been suffering [from] juvenile arthritis, but they had never been diagnosed. At Sihanouk Hospital Center of HOPE, arthritis patients can be diagnosed and, depending on their economic situation, treated early. Fortunately, methotrexate is now readily available, and the physicians are comfortable with its use (although this is not the case in rural areas). At this time, there is only one biologic available in the country—Actemra (tocilizumab)—and it costs $800 a month. These patients have very severe disease; they present with nodules, meaning that it is a skewed population. Exacerbating the bleak situation, says Dr. Seligman, is that due to a lack of training, many practitioners—including traditional medicine providers, pharmacists and physicians—who remain outside the urban areas often underdiagnose or miss conditions such as lupus. “There is a lack of medical education regarding lupus and other arthritides, and patients often seek assistance from pharmacists or other providers for first-line care, which until very recently has been unregulated,” she says. “Patients often get prednisone-containing medications from a pharmacist, and then by the time they go to a hospital they have been on it for years; by that time, it is often too late to prevent the long-term sequelae. There are other medications and antibiotics often dispensed. It is impossible to really know what they get. 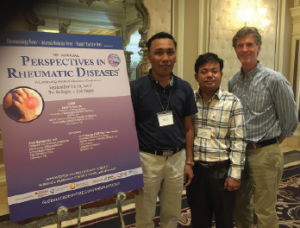 Dr. Khun (far left) attended a continuing medical education program on rheumatology this fall in Las Vegas. “There are now four medical schools in Cambodia, [but] there doesn’t seem to be much of a focus on rheumatology,” Dr. Seligman says. “What gives me hope, however, is that through the years, the overall rheumatology knowledge level of trainees has improved substantially. Dr. Khun knows what challenges await him each morning, and he shows up anyway. A champion of hope, Dr. Khun saves his evenings for rheumatology lectures. “Our universities have training programs for dermatologists, cardiologists and others,” Dr. Khun says. “So far, we have none for rheumatology. Along with two other physicians who are interested in rheumatology, I train the junior doctors. “Compared to the past 10 years, I can say there is a bit more rheumatology knowledge, and in the cities doctors are able to make diagnoses earlier,” Dr. Khun says. “For the most part, however, by the time patients reach us, they are very sick. In addition, we lack the capacity for reasonably priced immunology tests. As for treatment standardization, Dr. Khun says, “There are no national guidelines for rheumatology conditions. I earned a certificate from the European League Against Rheumatism, so we follow those guidelines, as well as those of the American College of Rheumatology. Elizabeth Hofheinz, MPH, MEd, is a freelance medical editor and writer based in the greater New Orleans area. Drs. Khun and Seligman acknowledge the following individuals for their dedication and exemplary efforts in caring for those with rheumatologic problems: Kim Meng, MD, executive director of HOPE Worldwide Medical Centers; Lim Kruy, MD, SHCH chief of medicine and director of education and research; Gary Jacques, MD, HOPE worldwide director of development in Cambodia; Thai Sopheak, MD, executive director of the Sihanouk Hospital Center of HOPE; and Health Volunteers Overseas. Rheumatologists interested in volunteering can contact Health Volunteers Overseas or Dr. Seligman via email (vas384@mail.harvard.edu). Cambodia minimum wages. Trading Economics. 2017 Aug.